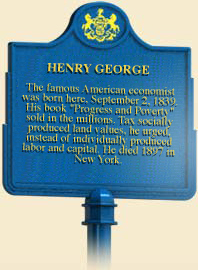 "Henry George is one of the great names among the world's social philosophers. It would require less than the fingers of the two hands to enumerate those who, from Plato down, rank with him. ... No man, no graduate of a higher educational institution has a right to regard himself as educated in social thought unless he has some firsthand acquaintance with the theoretical contribution of this great American thinker." 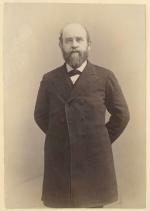 Although he is little known today, Philadelphia-born Henry George (1839-1897) in the late 1800s mounted one of the most popular refutations of the Gospel of Wealth. One of nation's most influential political reformers, his "single tax" movement won enthusiastic followers around the world. George was educated primarily at home by a tutor, through reading, and by attending lectures at the Franklin Institute. At the age of fifteen, he took to the sea, traveling to California, Australia, and India. By 1858, he had settled in California, where he married, had four children, and by 1865 was begging for his living in the streets. IAfter finding work with two San Francisco newspapers, his fortunes improved. Visiting New York City in 1868, he published an article with the New York Tribune that made him a hero on the West Coast, when he called for restrictions on the immigration of Chinese workers. Rather than condemn the Chinese, however, George blamed their presence on the greedy capitalists who had accumulated great wealth while the poverty that he himself had known only too recently continued to increase among California's and nation's growing working class. In 1870, George published Our Land and Land Policy, a radical treatise in which he examined the causes of America's growing inequalities in wealth and began to develop his ideas for remedies. Back in California, he became a Democrat and ardent free-trader in opposition to the protective tariff the pro-industry Republican Party had adopted during the Civil War. He joined the American Free Trade League and wrote numerous articles denouncing private ownership of land and other natural resources. This work culminated in his masterpiece, Progress and Poverty: An Inquiry into the Causes of Industrial Depressions and of Increase of Want with Increase of Wealth (1879). Only labor produced wealth, George argued, but because wealth was greatly increasing and resources scarce, owners of resources or land received unearned "rent" off the backs of productive members of society. The solution was a "single tax": Government should take over all land and resources, abolish all other taxes, and then allow productive people to profit fully from their work and inventions, which in turn would increase productivity. Government would have plenty of wealth to bring the good life to everybody in an economy of plenty, and "the Gospel of Christ" would be the reigning principle in a society of plenty where there was no competition for scarce resources. George's beautifully written book found devoted readers, and converts around the world. In the early 1880s, George went to Ireland, where members of the Irish Land League were withholding rents from English landlords to persuade them to surrender their property, and sent reports to the Irish World and American Industrial Laborer. Upon his return home, he was received as a hero by the New York workingmen's Central Labor Union. By 1884 he was back in Britain, speaking against the clearances in Scotland where clan leaders replaced their poorer kinsmen on their estates with more lucrative sheep. George and his ideas were now at the center of discussion in British Liberal politics, Irish and Irish-American popular movements, and elite free-trade circles in the United States. Returning to New York in 1886, George became the Central Labor Union's candidate for mayor of New York, finishing second to Democrat Abram Hewitt and ahead of Republican Theodore Roosevelt. He then organized The Anti-Poverty Society and published a newspaper, The Standard. The Single Tax League his followers founded kept campaigning for the panacea George had urged in his writings. George toured Australia, New Zealand, and Britain again in the 1890s; he came out for Democratic presidential candidate William Jennings Bryan in 1896, and again ran for mayor of New York City in 1897, but died four days before the election. George's economic theories had tremendous appeal on both sides of the Atlantic Ocean. He won wealthy converts, who attempted to bring his theories into practice, including Russian writer Count Leo Tolstoy, who surrendered his estates to a cooperative run by peasants. Single tax movement leader Joseph Fels, 1910. 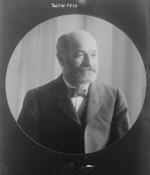 After George's death, leadership of the single tax movement was assumed by Philadelphia soap manufacturer Joseph Fels (1853-1914), who founded cooperative communities in Chester County, Pennsylvania (the Rose Valley Arts and Crafts Community); Fairhope, Alabama; and Arden, Delaware (subsequently supplemented by Ardentown in 1922 and Ardencroft in 1950). In addition to communal ownership of land, Fels' communities practiced "Organic" Education, similar to the progressive education expounded by philosopher John Dewey, which encouraged student creativity through a curriculum that heavily emphasized the arts, and that eliminated competition for grades and honors. Fels weighed in on American foreign policy and also used his considerable wealth in British politics to bring about the first Labor government in 1910 and in 1911 to end the House of Lords' veto over legislation. Back in the United States, he in 1916 helped launch single-tax campaigns in a number of states. He was most successful in California, where the state legislature passed a law that based more than 70 percent of state taxes on land. Like many other Pennsylvania reformers, Fels realized he could do little to reform government in his home state. 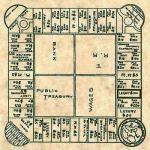 Nevertheless, Pittsburgh in 1911 and forty smaller cities by 1951 passed city taxes based principally upon land values. After World War I, the Single Tax movement lost its momentum, and George, who once enjoyed public acclaim second only Mark Twain and Thomas Edison, became a sentence in American history textbooks. This may be, in part, because George fit no standard category. He was neither an orthodox socialist, communist, nor free trader. His Single Tax and his whirlwind, world-wide espousal of a political economy that combined public ownership of land and resources with a free market became a widely popular and powerful critique of the unearned wealth and injustices produced by America's unregulated free market system. If George made some converts to his philosophy - there are still Single Taxers today - his greatest service was his powerful critique of an economic system that inspired many to find new and creative ways to correct the injustices he had pointed out with such passion and eloquence. Charles A. Barker, Henry George (New York: Oxford University Press), 1955. Arthur Power Dudden, Joseph Fels and the Single-Tax Movement (Philadelphia: Temple University Press), 1971. Agnes George de Mille, Henry George Citizen of the World (Westport CT: Greenwood Press ), 1972. Arnold J. Rose, Henry George (New York: Twayne), 1968. Steven Cord, “Henry George and Urban Renewal in Pennsylvania,” Western Pennsylvania Historical Magazine 52 (1969): 117-128. Kenneth C Wenzer, ed., An Anthology of Henry George's Thought (Rochester: University of Rochester Press), 1997.